Gun control advocates won plenty of victories in 2018. What will 2020 bring? Proponents of stricter gun control laws had some successes in the midterm victories but they're not resting easy. WASHINGTON — For gun control advocates, the 2018 midterm elections were largely a success. They defeated at least 15 House Republicans with “A” National Rifle Association ratings, unseating them with Democrats holding an “F,” the Wall Street Journal reported. They outspent the NRA and pro-gun rights groups for the first time, $10 million to $8 million, per data compiled by the Center for Responsive Politics. And they had voter sentiment on their side — 59 percent of all voters in the election said they supported stricter gun measures, according to the national exit poll. 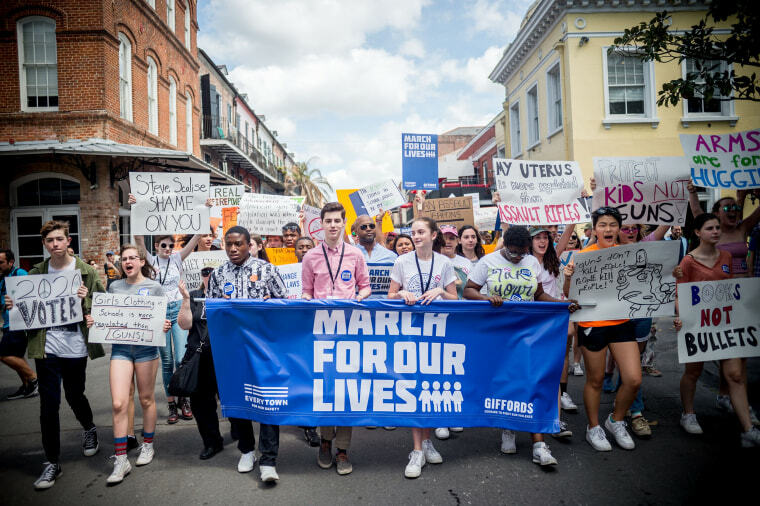 It wasn't all good news for these groups, however, as candidates in favor of fewer restrictions on guns won key Senate and gubernatorial contests in purple and red states. And gun control groups are fully aware that the NRA could make a comeback in 2020. “The NRA lobbyists are like cockroaches. Just when you think you’ve gotten rid of all of them, you shine a flashlight and there they are,” said Shannon Watts, the founder of Moms Demand Action, the grassroots arm of Everytown for Gun Safety. “Several times demise of gun lobby has been predicted. We re-calibrate and shine a light on their dangerous agenda,” she added. The NRA didn’t respond to multiple interview requests for this story. The midterms played out amid multiple mass shootings in 2017-18 — in Pittsburgh (Oct. 27, 2018); Annapolis, Maryland (June 28, 2018); Sante Fe, Texas on (May 18, 2018); Parkland, Florida (Feb. 14, 2018); and Las Vegas (Oct. 1, 2017). “I don’t want prayers. I don’t want thoughts,” said Susan Orfanos, whose son was killed in November in the Thousand Oaks, California, shooting that took place the day after the midterms. “I want gun control, and I hope to God nobody sends me any more prayers,” she told a CNN affiliate. One of the big victories for gun control advocates was in Georgia where Democrat Lucy McBath, a first-time candidate who became a gun control supporter after her teenage son was shot and killed in 2012 by a man who said the boy was playing music too loud. McBath bested Republican Rep. Karen Handel in a suburban Atlanta district that leans Republican — and where Democrats fell short just last year in a costly and high-profile special election. Indeed, revenue at the NRA dropped by $55 million, or 15 percent, in 2017, according to IRS filings obtained by The Daily Beast. Still, the NRA mobilized enough support to secure significant victories for Republicans and pro-gun rights supporters. NRA-backed candidates triumphed in gubernatorial races in Georgia and Florida — two of the marquee contests of 2018. The NRA also invested in GOP Senate candidates in Indiana, Missouri and North Dakota — all of whom ousted Democratic Senate incumbents. A chief target of the NRA was Sen. Joe Donnelly, D-Ind., whose NRA rating dropped from an A in 2012 to D in 2018, according to the NRA Grade Archives. The NRA spent nearly $1 million on negative advertisements against Donnelly, who was ultimately defeated by GOP opponent Mike Braun. “Large corporations can’t just put dollars in the pocket of politicians,” said Adam Alhanti, 18, a senior at Marjory Stoneman Douglas High School, who survived the fatal shooting in February that killed 17 and who voted for the first time in November.